Thank you all for your prayers! The summer here can be a little slower going since many people go on vacation outside of the city because of the heat. It is also the time of year that we have visitors from around Europe that want to attend church on Sunday. That part has not really happened this year and it has not been particularly slow either! After many of the people from the Middle East moved on to different places in Europe, we had a downtime with only 3 remaining. 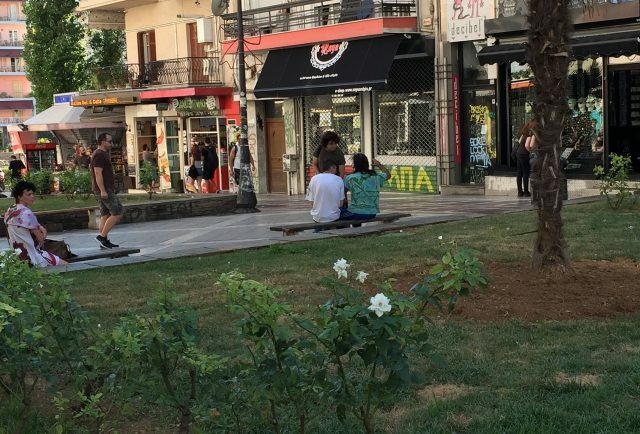 However, the couple that has been here since the beginning of the group (March) came back from Athens unable to get out of Greece and they are trying to find some work and a place to live because they want to stay here for good now. Please pray for a couple that God would provide both work and a place to live. We were able to help them with a place for the month of August so they could leave the camp (very difficult conditions there and far from the city – makes for difficult times to get to the city to try and find work/home). They are a big blessing and we have enjoyed watching them grow. They both had to appear for asylum interviews with the police and those interviews typically have religious questions as the authorities try to see if Middle Eastern people are just claiming they are Christians to get into Europe (ironic that the Greek police are trying to see who is a “true” Christian!). The interviewer asked (the wife) if she could answer some questions about the Bible and she said “ I could talk about the Bible through tomorrow night!” and she proceeded to tell them all about the Lord and what she has learned in her short time here. A great blessing! We had new Middle Eastern visitors over the last couple of weeks – 5 new men. We have started from square one again to get to know them and understand their backgrounds and stories. I always take it slowly and speak with each of them after a little while to understand what their relationships are with Christ. It is true that some people like to claim Christianity just to try and get preferential treatment so it is nice to see them coming to church, Bible study and the introduction Bible studies each week and get to know them. Please pray for these 5 men. One of them I am fairly certain is saved from his testimony but I am not sure about the others. However, they are getting the gospel all the time and Elia is doing a great job of speaking with them in their native tongue to get to know them better as well. A couple of weeks ago, an orphanage that some anarchists had taken over and allowed immigrants to live in was raided. There are two teenage boys (brothers) who have been coming to church for a while that lived there and they were woken at 5am, pulled out of bed, taken to the police station and searched. No one was allowed to take anything with them (terror fears, the police said). Actually, the police ended up selling all the immigrants’ belongings on the sidewalk outside the building. That meant that the people from our church that had things in the building ended up losing everything they did not have with them. For the boys, it meant losing everything but the clothes on their back. These brothers left their home country earlier this year after their parents and sister were killed by people there and they had crossed Afghanistan, Iran, and Turkey with whatever they could bring with them. It was such a blessing to see people from church, some of whom had little themselves, come together and supply clothes, bags, shoes, and some other things to help them out. They are waiting now to see if they can get some minor exemption to go to friends in northern Europe. Please pray for these boys (they are saved). Last Sunday, we had a new visitor after church was over. This older man had found one of the tracts in the neighborhood in the street and picked it up and read it. He said it was very sweet and he loved the words. He came back Wednesday and will be in church tomorrow as well. He said he loves church and actually knows some of the hymns as well. He says he became a Christian some time ago (he said, not Orthodox) and wants to speak with me some more. Please pray for George. Thank you for praying for the people that are not saved that have been coming to church. Also, please continue to pray as gospel tracts go out throughout the city. 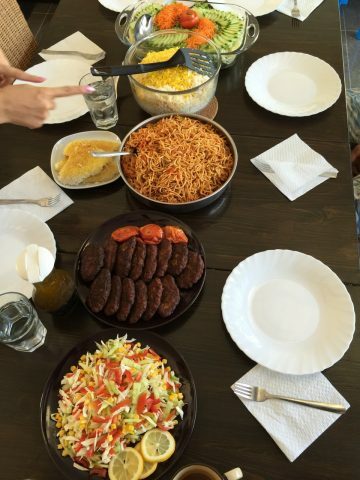 Last night, the wife from the Middle East made a wonderful native feast for us. They were very happy to make a meal for us and show us some of the recipes from their homeland. It was really nice to enjoy that time and see how excited they were to do it for us. Having fellowship with these sweet people has been a great blessing. We are very thankful that the Lord has allowed us to be here and we are also very thankful for your prayers and support. Our family is very content living in Greece and we know that much of that is due to the prayers of God’s people for our family and the work. The wonderful Middle Eastern feast made for us by our friends from church.